Amongst other things, the bake sale protest  got us thinking about campus snacking. Krispy Kremes were on Sproul the other day, alongside a foray of other delights from societies and clubs that sparked discourse on the snacking schedule. Given all this heated debate over munchies, we’ve taken some time to consider the ideal snack intake for three 90-minute, back-to-back lectures — a routine that mirrors perfection. Fuel well before you start the day on campus. Aiming for a breakfast of at least two slices of toast with honey and butter would be a good standard for everyone. 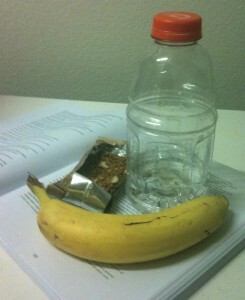 Take a regularly sized banana, a liter of water and a nutritional bar to campus. Reward yourself 30 minutes into the start of the first lecture with a banana, leaving a portion to nibble on through the rest of the session. Regular sips of water taken throughout the lecture will help your concentration towards the end of the day and ensure that you’re able to keep going with the day beyond class. Make sure to refill your water bottle between lectures — you should be done with one liter by the time you’re entering your third lecture. Just before your second lecture, unwrap the nutritional bar, leaving it on your desk to avoid having to open it and distract everyone with the crinkly wrapper during the lecture. Let it sit there until the final 30 minutes of the class, then ingest. By now, you’re about to complete your third hour on campus, but try to keep a portion of the bar for your next lecture as a satisfying end to your four-and-a-half-hour stint of hunger management. In the heat and haze of rising cupcakes, snacking has taken on a new relevance. What keeps you going?